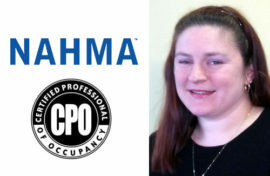 Braintree, Norton and Brockton, MA (August 2, 2017) – Peabody Properties announced today that Jeanne Suttie, Assistant Property Manager for Bixby Brockton Apartments in Brockton (a Peabody Properties community), has earned her Advanced Certified Professional of Occupancy designation through the National Affordable Housing Management Association (NAHMA). Suttie has worked with Peabody Properties since 2010, originally serving in the Melville Towers community, located in New Bedford. She advanced to her role as Assistant Property Manager of Bixby/Brockton Apartments in 2015. In this capacity, she is part of a team that manages a host of responsibilities to ensure a warm and well-functioning community. Bixby Brockton offers 106 apartment homes with one- and two-bedroom layouts and spacious and airy floor plans. The community is predominantly designed for seniors ages 62+, as well as persons with disabilities who are under age 62. In addition to her recently earned designation, Suttie is also an Accredited Residential Manager, through The Institute of Real Estate Management (IREM); Specialist in Housing Credit Management, Certified Professional of Occupancy, holder of the Fair Housing Compliance certification, and National Affordable Housing Professional designation through the National Affordable Housing Management Association (NAHMA). A resident of Norton, Suttie is also active with the Foxboro Jaycees, serving as 2017 Secretary and Board Member.